To many, tying a tie seems to be something complex usually left to mom or wifey (is there even a difference between the two?). For even more, tying a tie can be such a a difficulty or a chore that once it has been tied, they will simply loosen it and leave it so. Unfortunately, there is no scientific consensus or research to explicitly prove that keeping a tie tied is bad, but it is general knowledge among tie aficionados that doing so can ruin the shape and longevity of the tie, especially if it is made of silk. By keeping a tie knotted, you are increasing amount of wrinkles within the tie each time you loosen and tighten it, making them look worn out, like yesterday’s boxers. Like a well made suit, a tie is meant to be hanged so the material can rest. Here you will find simple steps and videos to tying the most basic knots that every man should know. The first step is to put the tie around your neck. For demonstrative purposes, make sure the thicker part of the tie hangs over your left side, and the thinner side on the right. The wider tongue should be hanging significantly lower than the narrow tongue. A difference of about twelve inches is common. Take the thicker side and cross it over the thinner side towards the right and loop it behind and around the thinner side like in the second illustration from the left, in the above image. The larger tongue should end up crossed over the smaller tongue like when you first crossed it over before the loop. After the tie has been wrapped once around the thinner part, as mentioned above, slide the thicker tongue of the tie up into the space of the loop between your neck and barely-shaped knot, as can be seen in the third illustration from the left. When completing this step, the front of the tie should be facing your neck while the back of the tie (the side with any brand tag) faces outwards. You know you have correctly completed the last step if the thick part of the tie can hang completely down and cover the almost-complete knot you have made. Next, hold the front end of the knot a bit so it is somewhat loose and then carefully slide in the thick part of the tie into the hole at the top of the knot and gently pull it through and to tighten it and close the knot. The simple knot is only looped around once and only from one side. This is what gives it its asymmetrical look. This kind of knot is ideal for skinny ties and small collared shirts. It would not be recommended to use for a very formal even such as a wedding or ball. It is more suitable for office work or other less formal events and occasions. If you’re still having difficulty to get the knot right, check out this video from YouTube user tieatie. The Windsor knot is the mack daddy of tie knots. Also known as a Double Windsor or Full Windsor, its kind of like the bigger brother of the Half-Windsor. The two types of knots are meant to be symmetrical and the only main difference between the two types of knots is that the Half-Windsor is better for skinnier ties and skinnier men because the knot ends smaller and less thick, once tied. The Full Windsor knot is larger and is better for ties that have a thicker material, spread collars and larger men. Both knots are essentially tied the same, with one or two small differences in the process, and both are perfect for more professional or elegant occasions. If you are wearing a tie on your wedding day, or for a big presentation at work, the Windsor or Half-Windsor should be your knot of choice. According to gentlmanly mythology, the knot is believed to have been invented by the King Edward VIII, the Duke of Windsor. Another story is that the knot was modelled to copy the way King George V (Edward’s dad) used to knot his ties. You can read about the mysterious and shadowy history of this knot and the men believed to have created it here. Like the Simple knot, and all other knots for that matter, begin the process of this knot by placing the wider end of the tie over your left side and the narrow end of the right. Keep in mind that because this kind of knot is meant to be large, you need to make sure the wider end hangs significantly lower than the narrow end, otherwise your tie will end up being short or the narrow end may hang lower than the wider end. Cross the thicker end of the tie over the narrow end towards the right. Pull the wider end up through the loop between your tie and neck and hang it over towards the right, as you can see in step 2 in the image above. Make sure the back of the tie is facing away from you when you are putting it through the loop. Place the wide end behind the narrow end, pulling it towards your left side. Pull the tie back up into the loop and pull it around as you just did in the step before the last, as seen in steps 5 and 6. The back of the tie should be facing away from you by the end of this step. In the next step, you will wrap the wider part of the tie over the narrow part towards the right. Slide it up through the loop one more time like in step 2, with the back of the tie facing away from you and gently bring the thick end of the tie through the knot. Pull at the knot carefully to tighten it, and there you have a Full Windsor! This knot can be really tricky to perfect, so check out this great and very detailed video below by Gentleman’s Gazette to help you nail it. 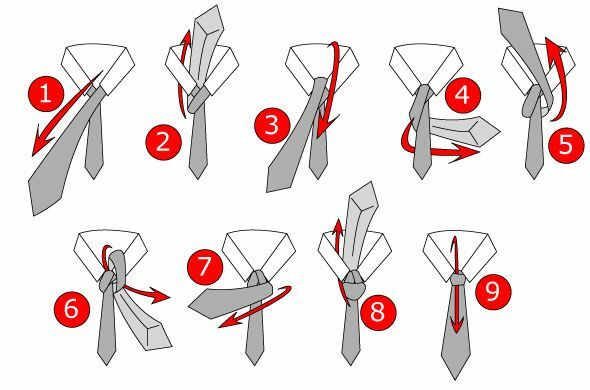 It also provides you with info on which types of ties are best for this kind of knot and so on. You will definitely feel more knowledgeable after watching it. **Pro-tip: The Full Windsor knot is the perfect companion to a power tie. As mentioned above, the Half-Windsor is simply a smaller version of the Full Windsor. This tie can be worn for similar occasions and it is also meant to be symmetrical, although it can seem to be a little less so than the Full Windsor. 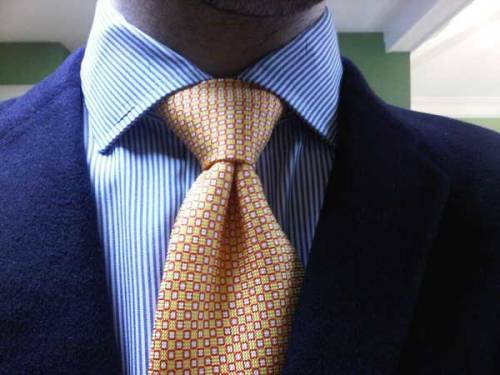 This type of knot is ideal for thinner ties and ties that are not very thick. It is probably more popular than the Full Windsor because it is meant to be used with thinner ties, which is currently more in style. The Half Windsor is done in the same way as the Full Windsor except that it is looped into the collar once instead of twice. This is why the know as a whole seems smaller and why it works better with thinner ties. Smaller knots are better for shirts with smaller collars and would look weird with a large collared shirt. It would also look great with a shirt that has a spread collar. Please make sure you pay attention to these kinds of details! Begin by placing the tie around your neck with the wider end hanging over the left side and the narrow end over the right. Make sure that the thicker end hangs lower. Pull the the wide end over the narrow end towards your right and then up into the loop between the tie and your neck. Once through, it should be able to hang down over the narrow end. Wrap the larger end of the tie once around the thinner end and back up into the loop as in the last step. Bring the thicker end through the space in your knot and gently pull it through to tighten the knot and voila! You can see that this knot is smaller than the Full Windsor. If you are still having difficulty getting this knot done check out this very helpful YouTube video for a detailed step-by-step guide on perfecting this knot. There are numerous types of knots for numerous types of shirts and occasions, but these three basic knots should be more than enough to get you by anything life throws at you. One VERY important tip to know when tying a knot, is that you have to keep your knot tight at each step, otherwise the knot will come out loose or uneven. We hope you found this guide helpful and that you learned one of the most basic and essentials skills a man should have! Let us know what you think or if you have any questions or requests in the comments below and don’t forget to check out our incredible collection of silk ties here! 2017 Vizoni Uomo™. All Rights Reserved.